Coconuts! The coconut is very interesting and is something to which I can relate. When Magellan rediscovered the Philippines for the western world, his ship was met by friendly people who offered him coconuts among the various provisions he badly needed. Throughout my study of the Malayo-Polynesian Language, I found out that the word "niyug" (coconut in Pilipino) is the same in all the Pacific Islands and Southeast Asia. Borneo, an island nation in the south of the Philippines is named after the Malay word "buah nyior" meaning "coconut." The fruit is the lifebread of the Pacific Islanders. The Discover Aug 1995 issue stated that "among the most riveting mysteries of human history are those posed by vanished civilizations." Everyone who has seen the abandoned buildings of the Khmer, the Maya, or Anazazi is immediately moved to ask the same question: Why did the societies that erected those structures disappear? Easter Island was a paradise when the people came. During the transporting of the Giant Monuments in Easter Island, coconut trees were used as rollers. The trees are no longer found in the islands. The whole project was so huge and extravagant that all the natural resources were completely exhausted. The last coconut tree was cut down as the last giant structures stood up. 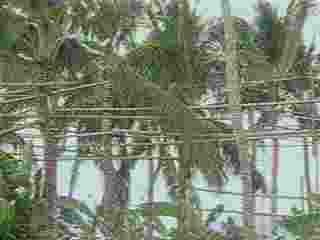 Scholars for a while were puzzled because of the absence of trees in the small islands but they found ancient coconut fibers and traces of its existence during the height of the island's civilization. Man drove himself to almost extinction in the Island. Our ancestors certainly had the natural skill to build a coconut canoe. The Islanders could have sailed to America long before Columbus if they had not used all coconut trees but you could say they did not use their coconuts on their shoulders. The history of the island serves as an ecological warning. Suprisingly, the coconut has American origin. The fruit will float and is very durable. The inner shell has a soft double eye that sea water might permeate. Supposedly, thousands of years ago the fruit floated around the equatorial line to the Pacific and Caribbean seas. I suspect that, like the Malay traveled eastward to the Pacific, this hard fruit slowly found itself westward. Have you ever wondered why the Polynesians in the Eastern Pacific are all husky? Natural selection during ancient seafaring favored the men and women of the southeastern Asia who had the natural energy reserves to survive the harsh element of the sea. Why are the coconuts in the Southeast Asia bigger and meatier than in the American and Caribbean Coast? Only the finest variety can float long enough to live and root itself across the Pacific. John F. Kennedy survived the WW2 Pacific theatre when his message was etched in a coconut fruit carried by the natives to his allies. The message lead to his rescue. The fruit with his notes was saved and brought to the White House during his presidency. There is one thing of which I am sure: the tree is our universal tree of life. It is our food, milk, juice, wine, and alcohol. It is useful on woman's skin and hair. The shells are used as ornaments, combs, and clips. It is our source of soft and hard drink, our wine and romantic inspiration for our soul. The roots and fibers provide herbal relief to our body. During the holidays the fruit itself provides the ingredient for cooking the stuff to satisfy our sweet tooth. The swaying trunk captivates explorers as would the Polynesian dancer. Our ancestors built their boats and shelter with it. The tree can grow to almost 100 feet but is still strong enough to stand against the tropical wind. It is found mainly arlong the coast but they can also grow in the outlying mountains in the Philippines. The ancient seafarers carried the fruit both as food and floater during long voyages. Coconuts cannot be grown by grafting or by rooting. In Southeast Asia, Philippines in particular, coconuts are huge as opposed to in Mexico (or in continental America) where coconuts are pointy and small. Coconuts grow around the southern hemispheres around the globe: Africa, Asia and America. Trivial? Remember: You have to have a coconut to grow coconuts. The Malayo-Polynesian peoples have always traveled the waters with yams, coconuts, and sometimes pigs and dogs. The meat of the fruit is called copra and has been the Philippines' top export for a long time. However, it has declined recently due to fear of high cholesterol. The coconut is an all natural food while cholesterol is an animal by-product. Yet the health conscious world can not understand that the coconut has not a single cholesterol part in it. Computers and electronics have now replaced copra as our number one export this year. Remember what I said when the first European first stepped ashore? We exchanged "coconuts." A final anecdote on coconuts: When the homesteaders were settling down in the interior forest in the Philippines, they used the coconut tree to mark the line of ownership of the land. Some of the indigenous men were not too happy about these lines so they found ways to move the trees to another location. The guardians of the nature saved or delayed distruction of the forest. I was a kid when someone told me this and I can believe it but can not stop laughing. I guess I could coin it an example of "mountainsm"
moderate temperatures where the seedlings became established along beaches. dispersed coconuts can withstand occasional brief salt water flooding. literally floats above the denser salt water beneath the beach sand." before humans came along to speed up the process."